Beloved youngest son of Mary and Neil (dec). Thank you so much Mel for your love and help. The Celebration of the Life of the Late Mr Mel McKennay of Manjimup, formerly of Perth will take place at St Joseph's Catholic Church, Ipsen St, Manjimup on WEDNESDAY (24.4.2019) commencing at 11.00am. 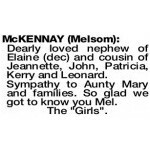 Dearly loved nephew of Elaine (dec) and cousin of Jeannette, John, Patricia, Kerry and Leonard. Sympathy to Aunty Mary and families. So glad we got to know you Mel. 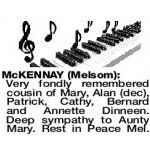 Deepest sympathy to Mary on the sad passing of Mel. Nephew of Doug and Carole, cousin to Jayne and Paula. Rest in Peace. 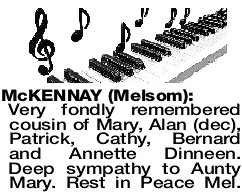 Very fondly remembered cousin of Mary, Alan (dec), Patrick, Cathy, Bernard and Annette Dinneen. Deep sympathy to Aunty Mary. Rest in Peace Mel. 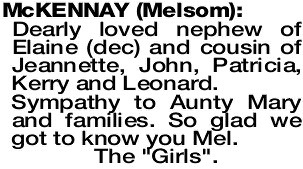 MCKENNAY MEL Loved nephew of Ross and Pauline, cousin to Lisa, Troy and Paul and families. Deepest sympathy to Mary.